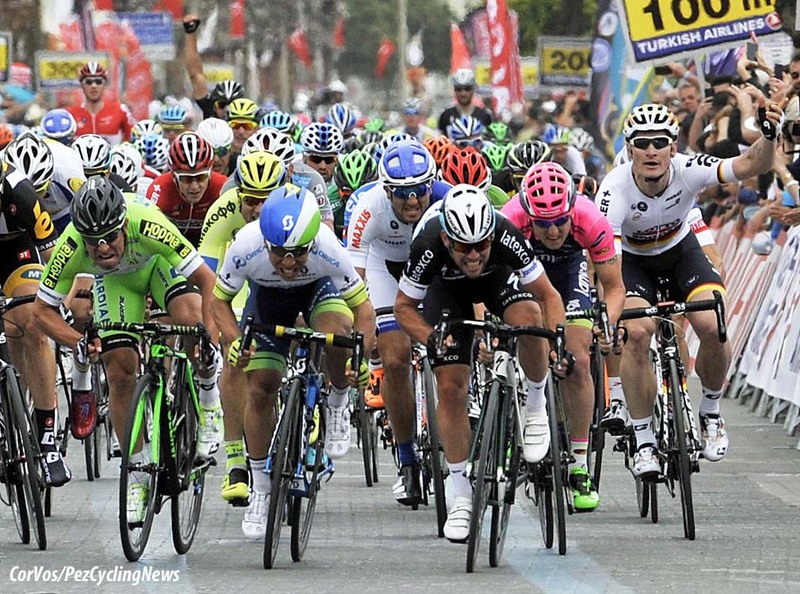 PezCycling News - What's Cool In Road Cycling : Sprinting Aerodynamics: How Low Can You Go? Sprinting Aerodynamics: How Low Can You Go? 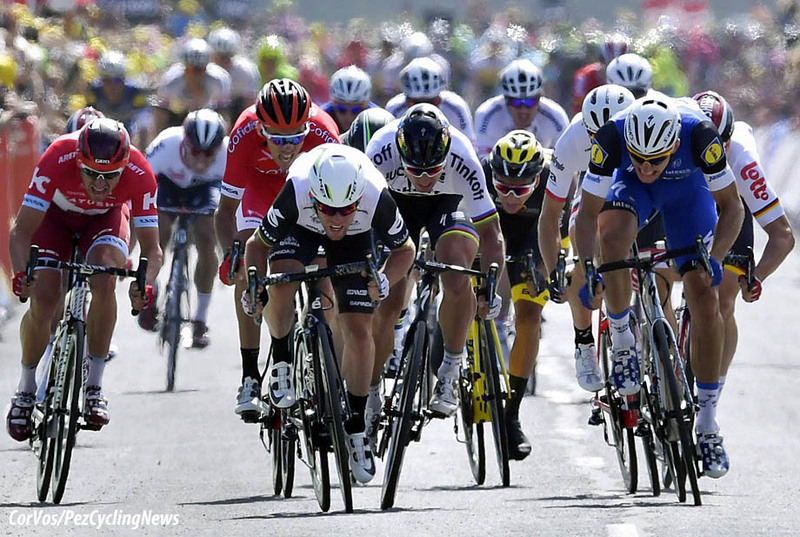 Toolbox: Mark Cavendish pioneered the super low sprinting position. 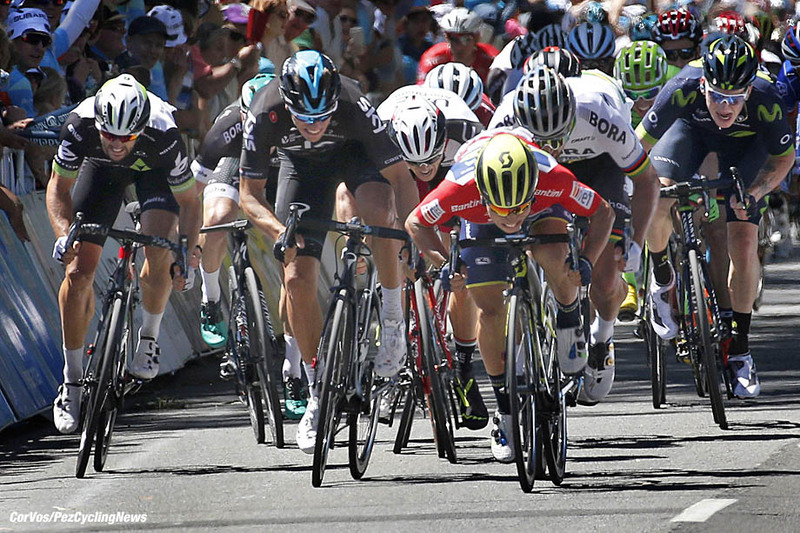 Then Caleb Ewan took the trend to new “depths” by dropping even lower and farther forward. Does such an extreme position actually result in sprinting aerodynamic benefits? There has always been a mystique about road sprinters and field sprinting. In many ways, field sprinters are like championship boxers or fighters, with dominant and larger-than-life personalities. Think no further than Mario Cippolini, ‘El Rey Leone” for Exhibit A. The alpha dominance theme is on full display annually at the Tour, where every sprint stage becomes a de facto world champs, and the hero one day becomes yesterday’s news the next. Over the past few decades, sprinting has become as refined and specialized as other disciplines within cycling. At the highest levels, we have seen the emergence of dedicated leadout trains like Cipo’s Saeco red train, or Cav’s HTC-Columbia rocket express. Aerodynamics has also become a dominant theme in sprinting. First came aero wheels, then aero road frames and handlebar/stem combos, aero road helmets, and of course skinsuits for road stages. Aero equipment is all great and good, especially when the gains become exponentially magnified at the 60+ km/h typical of pro road sprints. But as we all know, our bodies make up the biggest component of the battering ram when it comes to fighting wind resistance. So can we develop a more aerodynamic sprinting position? Mark Cavendish has been the dominant road sprinter of the past decade. When he first came on the scene, he was easily distinguished by his very low sprinting position. Compared to his contemporaries, the difference in frontal surface area is remarkable. While larger sprinters like Greipel and Kittel can generate much higher peak power, Cav’s lower position maximizes the power:frontal surface area ratio. 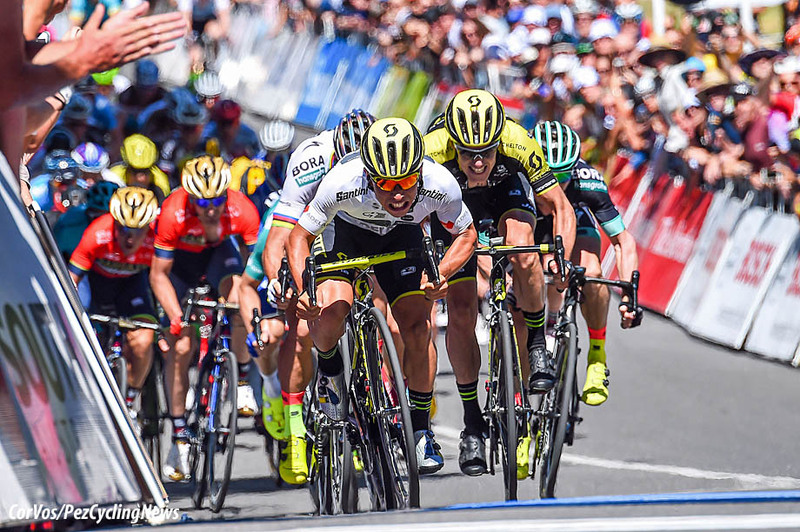 Over the past half-decade, Caleb Ewan has burst onto the scene with an even more extreme low and forward position, to the point that his head seems below his handlebars and his shoulders are well forward of his stem. The question then becomes – does this low position truly reduce aerodynamic drag? • Eleven club-level cyclists performed 250 outdoor sprints at three speeds: 24-26, 31-33, and 39-41 km/h in each of the 3 sprint positions. This was done in two directions, for a total of 18 sprint efforts per participant per trial. Experimental trials were done twice to determine reliability of calculations. • Participants had 100 m run-up to accelerate to the required speed, and had to maintain that speed range and position for the 250 m test section. Speed, power, cadence, were all recorded. All relevant environmental factors (wind speed, temperature, air pressure, etc.) for calculating CdA were measured. • A high definition video was taken at the mid-point of the 250 m test section to ensure the desired sprint position was maintained. On the video image, the front wheel was standardized at 200 pt in size. Vertical distance was then reported as the distance between the chest and the bottom of the front wheel, while the horizontal distance was the shoulder relative to the front hub. Here, a negative number means that the shoulder was in front of the hub. • Vertical distance for standing was 361 pt and for forward was 311 pt. • Horizontal distance for standing was 26 pt and for forward was -3 pt. The positions over the two test days were repeatable. • Environmental conditions and the variability in cycling speed were similar across the two test days. • CdA for seated, standing, and forward were 0.363, 0.372, and 0.295, respectively (lower values represent less drag). The forward CdA was lower than both seated and standing, with no differences between the latter two positions. Optimizing aerodynamic drag and refining bike position has become de rigeur in time trialing and triathlons. However, this is a rare study that examines the aerodynamics of sprinting itself. One limitation of this study was its primary focus on CdA, with speeds controlled. What was NOT tested was the maximal speed the cyclists could achieve with each position, which is a combination of both maximal power and aerodynamic drag. Assuming that the forward position does not impair maximal power, the ~25% improvement in CdA at a power output of 865-1140 W would result in a 3.9-4.9 km/h increase in velocity, which goes well beyond a marginal gain to a massive gain. Cav and Ewan are both smaller sprinters, so another fair question is whether larger riders can train themselves to adopt the forward position. One thing I found interesting here was in the size of the participants being much taller (1.79 m) and heavier (79 kg) than Cav or Ewan. Nevertheless, they were largely able to successfully learn and maintain the forward position. Of the 11 cyclists, two were ultimately excluded due to not being able to maintain the required positions. What this study demonstrates is that, for all the focus and fun devoted to aerodynamic equipment, body position remains the dominant pathway to free speed. This is true not just for time trials, as this study shows the major gains potential in the race-winning sprint. While I’m not necessarily advocating that everyone tries to emulate Ewan’s extreme forward position, I would say that max speed isn’t just about max power. So experiment with different sprinting techniques and positions to see which gives you the best combination of power and aerodynamics, and ultimately speed.